On March 16th, MOMOLAND released their track list for their upcoming fifth mini album ‘Show Me‘. Check it out below! The mini album has six tracks in total, including an instrumental version of their title track. They have not yet released the title of their title track, which is why there is a question mark instead. The image is pink and white with cute teapots on it. MOMOLAND will make their comeback on March 20th with their fifth mini album ‘Show Me‘. This comeback will have a darker and edgier concept than their previous releases. Daisy and Taeha will not participate in this comeback due to health and personal reasons. Stay tuned! 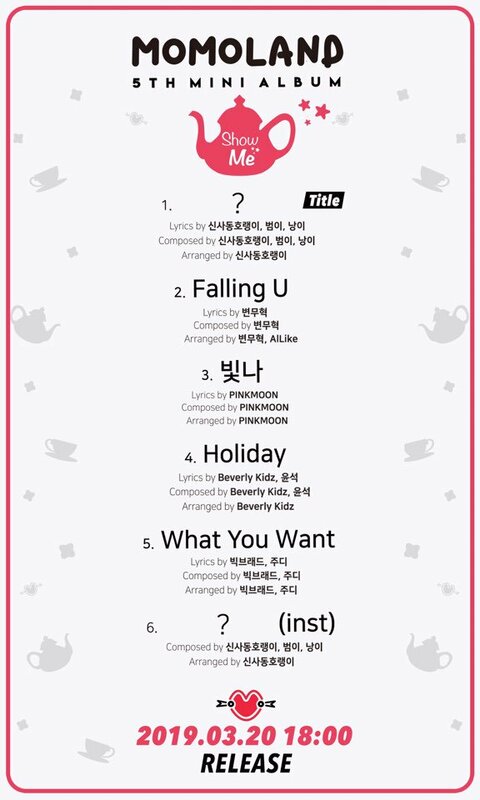 What do you think about MOMOLAND‘s track list for ‘Show Me‘? Let us know in the comments below.